What is One Way to get Children into Action? 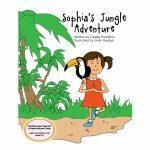 I am excited to announce my first published book Sophia's Jungle Adventure, a story about Sophia and her family as they journey through a Costa Rican jungle. It is a kids yoga sequence (for ages four to eight) woven around a story and includes a List of Kids Yoga Poses and a … [Read more...] about What is One Way to get Children into Action?